Set in a streamlined stone building, this polished hotel is 1 km from the Church of the Holy Sepulchre, and 2 km from both the Western Wall and the Dome of the Rock. Decorated in neutral tones, the understated rooms provide free Wi-Fi, flat-screen TVs and city views, as well as safes, minifridges, and tea and coffeemakers. A breakfast buffet, served in an airy dining area featuring arched windows, and parking are complimentary. There's also a lobby lounge, and a terrace with shaded seating. 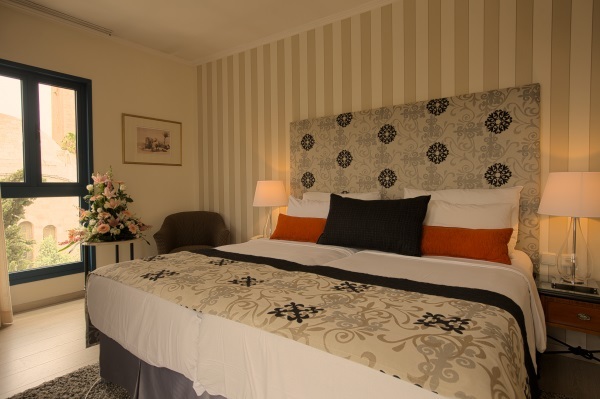 Standard roomA standard room features a small double bed (55 inch wide), a minibar and cable TV. Superior RoomThis room has cable TV, air conditioning, minibar, double or twin beds. Coffee maker, safe, telephone, free Wi-Fi.